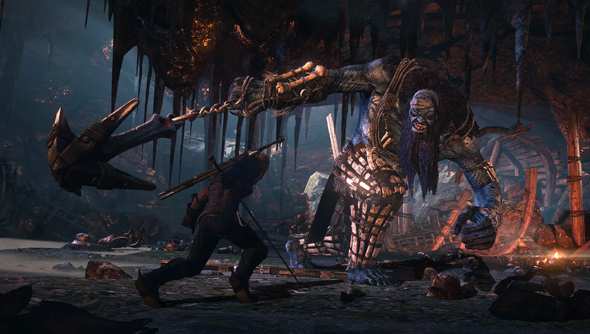 Two and a half weeks ago, CD Projekt RED flew to San Diego to show a lengthy chunk of The Witcher 3. But their PCs were damaged in transit, leaving their 30 minute demo totally soundless. A fact they weren’t privy to until the moment Geralt opened his mouth on-screen. Fortunately, Doug ‘Geralt’ Cockle and an impromptu cast of game – very game – developers were on hand to fill in the gaps. Despite CD Projekt’s best efforts, you’ll soon notice that there’s no comedy voice more absurd than Cockle’s larynx-throttled antihero drawl. The panel itself has since popped up on YouTube. Skip to 7:30 for a meandering pre-demo chat in which Cockle reveals what The Witcher 3’s increased scope has done for his workload (“It’s been a heck of a recording session.”). A Q&A begins 15 minutes in, and covers the possibility or lack thereof for a Witcher TV series (“Those rights are with [the author]… We’d love to see an HBO show but this is not in our power”), catering to players who aren’t Witcher-literate, “taking steps” to address difficulty spikes, and missing orphans. Did you allow yourself an askance glance at The Witcher 3 leak? Or will you let the plot roll over you like a marauding troll come February? In the meantime, here’s how CD Projekt RED fought the publishers to win their independence.